Latin America: Is There Hope for Prosperity After the Commodity Price Boom? This blog was previously published in The World Post. Talk about ‘growth’ in Latin America has become less upbeat today than a few years ago. That’s no surprise. For over a decade, average growth meant at least double the economic activity that we are seeing today. However, recent declines in commodity prices and turmoil within financial markets have spurred fears of crises and growth stagnation in emerging economies. And countries within Latin America and the Caribbean have been particularly affected by the “great deceleration,” which is now entering its sixth year. In fact, in terms of growth slowdown, the region has been the hardest hit among the developing regions. Many countries are commodity exporters and their high financial integration has historically made them prone to the global boom and bust cycles. In addition, fluctuations in GDP growth across the region have been closely associated with volatility in commodity prices as well as other external conditions. 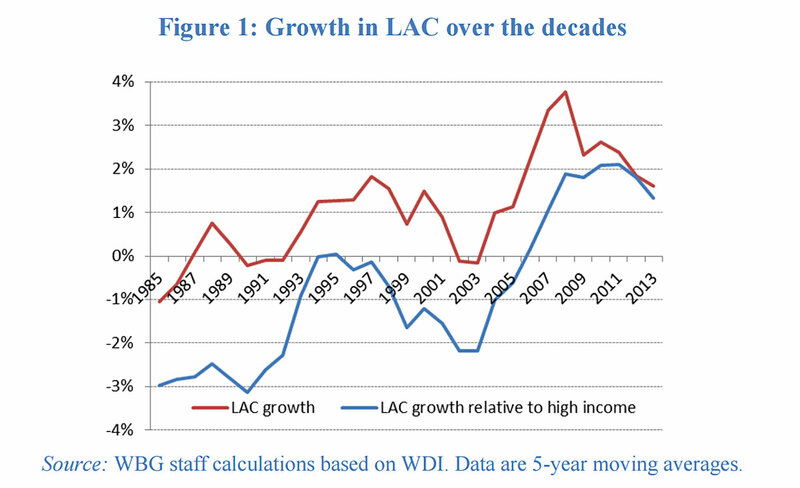 But as policymakers seek to revive growth, the questions become: how much can Latin America learn from its own impressive growth performance over the previous decade? And to what extent was that growth solely driven by favorable external conditions? 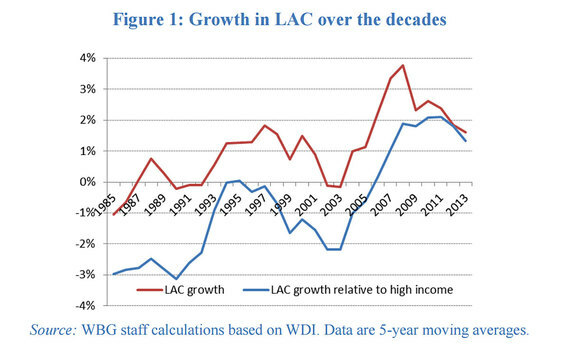 The extent of the region’s past performance (Figure 1) shows that growth has been robust by historical standards and outpaced high-income countries’ performance since 2006 (as indicated by the blue line, which shows the difference between GDP growth in LAC and in HICs). For the first time in decades, the region managed to get some convergence towards high-income levels. What is driving this trend, which has helped to considerably lower poverty rates? Was it driven by good domestic policies or simply by “good luck,” in the shape of a commodity price boom coupled with improved access to external capital? Structural policies, which capture progress in deep domestic growth factors such as education, infrastructure, and financial development. Stabilization policies, a proxy for macroeconomic short-run management (such as inflation). Pre-existing conditions, or persistence, which echoes effects from earlier periods, including past reforms. 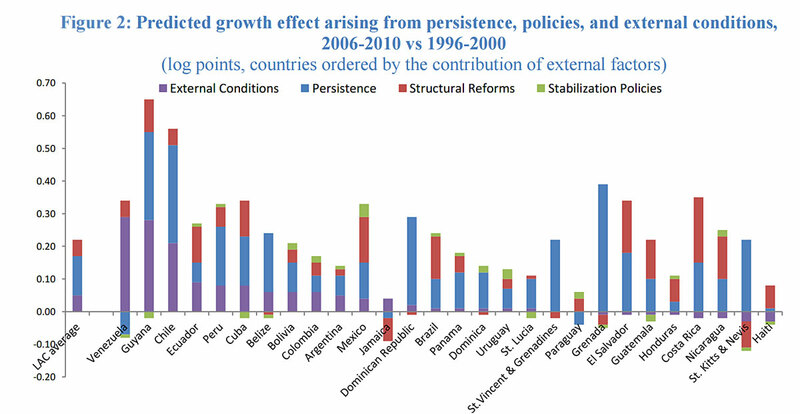 For the regional average, Figure 2 shows that the contribution made by external factors to growth was equal to that of structural policies (0.5 percentage points per year). By subtracting the portions of the bars representing external conditions we can assess what growth in Latin America would have looked like had commodity prices remained at their low level of the late-1990s. And on average, the slowdown in growth for the region would have been relatively small. Figure 2 further shows that stabilization policies had no impact on average. This suggests a shift in growth drivers compared to studies from the 1990s, which emphasized progress in stabilization-related variables, such as inflation, real-exchange rate appreciation, the incidence of banking crises, and government consumption. It may also reflect further the efforts of most Latin American countries to bring their macroeconomic houses in order during the 1990s. In turn, this enabled benefits to be reaped from other, more recent, sources of growth meaning that stabilization policies alone no longer constituted a means of additional growth. Source: Beyond Commodities. The Growth Challenge of Latin America and the Caribbean, World Bank 2015. Note: To convert into per annum changes in percentage points, all values need to be multiplied by 10. This combined picture, however, should not hide the considerable differences in growth drivers between countries, which reflect the region’s diversity. For example, resource-rich countries such as Venezuela, Guyana, or Chile all benefitted far more than 2 percentage points per year from the commodity price boom. Commodity importers, however, would have benefitted slightly from prices remaining at their late-1990 level. While for some countries such as Mexico, Colombia, or Nicaragua, progress in stabilization policies did pay off for growth. Our results highlight the importance of domestic structural policies for growth. While this does not mean that Latin American countries should stop worrying about falling commodity prices and tighter access to capital markets, growth trends should not be confused with cyclical factors. Our study, which focuses on the former, suggests that growth stagnation in the region could potentially be reversed by a renewed effort on the structural reform front. International financing for such policies, given the tightening of global liquidity, may also become more relevant in this context. Especially as we can confirm earlierresults that cyclical volatility does impact growth in the long-run. There also remains a large degree of heterogeneity within the region. Fortunately, many Latin American countries have strengthened macroeconomic tools to create a buffer against such shocks. The good news is that growth-promoting reforms played a more significant role in the region’s recent growth than they are usually given credit for - and, they can continue to do so in the future.